Can Percy the Pug find the perfect puddle? Young children will love this delightful board book version of a favorite, fun story. Percy the Pug loves puddles--big puddles, small puddles, swamp puddles, stomp puddles. No puddle is just right, though . . . until he finds one with three friendly piglets. But protective Mama Pig does not believe pigs and pugs should mix, and she chases Percy away He proves her wrong in a highly satisfying ending, earning himself a spot in the perfect puddle. 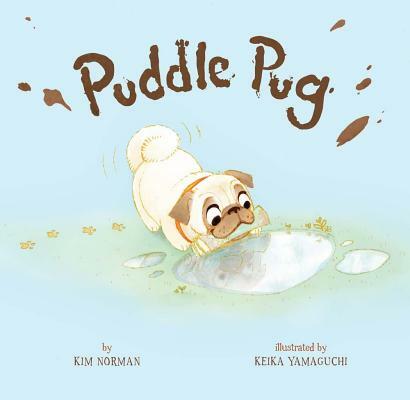 Irresistibly illustrated by Keika Yamaguchi, Kim Norman's tale about a persistent pug and his pursuit of friendship in puddle paradise brims with warmth and charm. Kim Norman and her husband live in Smithfield, VA. Kim is the author of several books for young readers, including The Bot that Scott Built; This Old Van; Ten on the Sled; If It's Snowy and You Know It, Clap Your Paws! ; and Crocodaddy (all Sterling). Visit Kim online at kimnormanbooks.com. Keika Yamaguchi graduated from the Art Center College of Design in Pasadena. A former Walt Disney Imagineering intern, she illustrated the children's books Teeny Tiny Toady (Sterling), written by Jill Esbaum, and Sick of Being Sick (3DAL), written by Justin Sullivan. Visit Keika at keikashouse.com to see more of her work. She lives in La Crescenta, CA.